Can monkeys spontaneously synchronize to audio? Setup for the three experiments (from discussed publication). It was recently shown that rhythmic entrainment, long considered a human-specific mechanism, can be demonstrated in a select group of bird species, and, somewhat surprisingly, not in more closely related species such as nonhuman primates. This observation supports the vocal learning hypothesis that suggests that rhythmic entrainment is a by-product of the vocal learning mechanisms that are shared by several bird and mammal species, including humans, but that are only weakly developed, or missing entirely, in nonhuman primates. However, since no evidence of rhythmic entrainment was found in many vocal learners (including dolphins, seals, and songbirds), vocal learning may be necessary, but not sufficient for beat induction – the cognitive mechanism that supports the perception of a regular pulse from a varying rhythm (Honing et al., 2012). Today a new study appeared in Nature Scientific Reports claiming to show rhythmic entrainment (or spontaneous synchronization as the authors refer to it) in the Japanese macaque (Macaca Fuscata). Intriguing! However, reading the paper it becomes clear quickly that the results might not be what they seemed at first sight. First, as was shown in several earlier studies, macaques can synchronize to an auditory metronome, but they tend to do this in reaction, and not in anticipation of the sound. They do not show the typical negative synchronization error: tapping or pressing a button slightly earlier than the actual sound, a sign that an anticipatory process (i.e. expectation) plays a role. Second, it is unclear whether the experiments are evidence for rhythmic entrainment: it could well be imitative behavior. This hypothesis is actually confirmed by the third experiment in which the monkeys were asked to synchronize with a virtual monkey (see panel C above) of which the auditory and visual information was presented independently as well as combined. The monkeys performed better for the visual condition as opposed to the auditory condition. In contrast, in humans it is the opposite: rhythmic entrainment is much stronger in the auditory modality. Lastly, the researchers only analyzed asynchronies between the button presses of the two monkeys sitting opposite to each other (see Panel B above). Therefore the results could well be simply support for an imitative, cq. reactive behavior instead of evidence for a periodic anticipatory reaction that is common to human rhythmic entrainment. Can the origins of music be studied at all? What was the role of music in the evolutionary history of human beings? And is it possible at all, you might wonder, to study this empirically, given the fact that neither music nor musicality fossilises? * So, better forget about it? 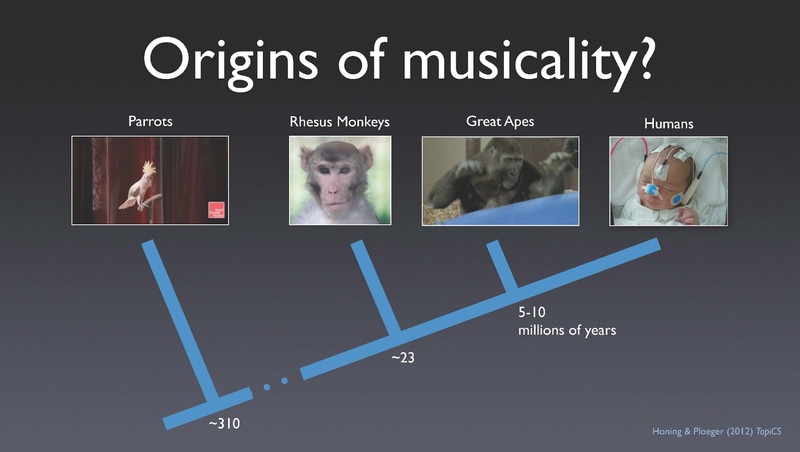 One potential strategy to address this question is to focus on the cognitive traits that could have contributed to the origins of music and musicality (cf. Honing & Ploeger, 2012) and see in how far we share these with other animals. While there has been quite some critique on this idea – i.e. the apparent impossibility of studying the evolution of complex cognitive processes such as intelligence (Lewontin, 1998; Bolhuis & Wynne, 2009)–, a bottom-up approach, in which one looks for the basic mechanisms that combine into a complex cognitive trait – in our case musicality –, seems an alternative and potentially fruitful way to proceed. While it is not uncommon to see certain cognitive functions as typically human (such as language), it could well be that there are more species than just humans that have the proper predispositions for music to emerge, species that share with us one or more basic mechanisms that make up musicality. The mere fact that music did not emerge in some species is no evidence that the trait of musicality is absent. In that sense a ‘bottom-up perspective’ (cf. de Waal & Ferrari, 2010) that focuses on the constituent capacities underlying a larger cognitive trait, in our case musicality, is a feasible alternative strategy to follow. So, instead of studying a complex cognitive trait (such as intelligence) in this approach one explores the basic processes that make up that trait. And in the case at hand: instead of asking which species are musical, the question becomes: how does musicality actually work? What are the necessary ingredients of musicality, and how did these evolve? It's these questions that will be the focus of the Distinguished Lorentz Fellowship in the coming year at the Netherlands Institute of Advanced Studies and the topic of an international workshop at the Lorentz Center. I'm looking forward to it! *N.B. the oldest music-related artifact currently known is dated ca. 43,000 old, quite meaningless on an evolutionary scale of million of years. Lewontin, R.C. (1998). The evolution of cognition: Questions we will never answer. In D. Scarborough & S. Sternberg (Eds. ), Methods, models, and conceptual issues: An invitation to cognitive science, Vol. 4 (pp. 107-132). Cambridge, MA: MIT Press.